San Miguel-Espinosa, C., Rámila, C., Leiva, E., and Lizama-Allende, K. (2019). "Boron and sulfate removal using rice husk as filtration material in horizontal flow constructed wetlands microcosms," BioRes. 14(1), 363-375. Constructed wetlands (CW) are being explored as an alternative treatment for boron removal. The efficiency of CW strongly depends on the substrate and plants used. A promising and inexpensive substrate is rice husk. This study explored the capacity of this residue to treat boron-rich wastewaters as main wetland substrate in laboratory constructed wetland microcosms. Two plants, Typha angustifolia and Puccinellia frigida, were used to evaluate their capacity to increase boron removal. It was found that CW removed ~40% of boron. Although both species presented high boron concentrations in their shoots (between 463 and 721 mg/kg), they did not enhance its removal. Interestingly, high sulfate removal was also observed, especially in non-vegetated cells (up to 68±18%), indicating that the presence of plants decreased their removal. Processes involved are probably biotic sulfate reduction and abiotic precipitation of sulfate minerals (hypothesis supported by PHREEQC modeling). Therefore, the performance of the system under continuous flow operation for a boron-and sulfate-rich wastewater indicates that rice husk has high potential as main media in CW for boron and sulfate removal. The presence of boron (B) in water sources is causing concern, especially in arid and semi-arid regions. Some of the most affected countries are Chile, USA, and Turkey (Türker et al. 2014). Agricultural activities are limited in polluted zones (Rámila et al. 2016b) because, despite the fact that boron is essential for plant growth, it is also highly toxic when exceeding a certain threshold. Boron concentrations exceeding 0.5 mg/L in irrigation water are toxic to most sensitive crops (Maas 1984), and the Chilean irrigation water quality guideline (NCh 1333) establishes a limit of 0.75 mg/L. Boron removal from water is difficult to achieve because it is found mainly as boric acid in neutral waters (H3BO3: pKa=9.3 at 25°C (Snoeyink and Jenkins 1980)). This molecule is very soluble, relatively unreactive, and does not undergo oxidation-reduction reactions, nor precipitates with the majority of cations (Parks and Edwards 2005). Conventional water treatments (i.e. precipitation-sedimentation, coagulation-flocculation) do not remove significant amounts of boron (Tagliabue et al. 2014). Currently used technologies consist mainly in sorption on functionalized resins and high-pressure membrane filtration, but these present the drawback of being expensive and/or generating undesirable wastes (ibid). In consequence, alternative, cost-effective, sustainable technologies such as adsorption on natural sorbents and constructed wetlands, are being explored (e.g. Sud et al. 2008; Man et al. 2012; Türker et al. 2014). Various natural sorbent materials, which can be divided into organic materials and minerals, have been tested for boron removal. Given that organic matter has high affinity for boron, organic materials such as peat, compost, and rice residues have shown higher adsorption capacity than natural minerals such as kaolinite, zeolite, and calcite (Jalali et al. 2016). Among organic materials, agricultural waste materials offer an ecofriendly, low cost, and easy-available alternative for heavy metal removal (Sud et al. 2008). One of the world’s main agricultural wastes is rice husk, reaching a production of 1.1 x 108 tons per year (Ye et al. 2010). This residue has been tested by Man et al. (2012) for its capacity to remove boron in batch reactors, showing promising results. These authors reported that rice husk removed between 71% and 84% of boron, and its adsorption capacity increased as initial boron concentration increased. Rice husk also removes other metals and metalloids, including chromium and arsenic (Sud et al. 2008; Ye et al. 2010), which opens the possibility for its application to treating different types of contaminated water. It is known that the presence of competing species such as sulfate and phosphate may affect boron sorption (Craw et al. 2006); therefore this effect must be investigated in order to bring this technology into real application. However, to find adsorption capacities, typically only boron concentration and pH are varied, instead of focusing on more realistic contaminated water where the presence of other pollutants such as sulfate could affect adsorption capacities. Constructed wetlands (CW) are a low-cost, environmentally friendly technology being widely applied to treat various kinds of wastewater. Constructed wetlands are classified into surface flow (SF) and subsurface flow (SSF). Subsurface flow constructed wetlands have shown promising potential to remove boron (e.g. Lizama Allende et al. 2012; Türker et al. 2013), and they are the most used types of CW to evaluate boron removal (Türker et al. 2014). Recently, horizontal subsurface flow (HSSF) CW have shown higher boron removal efficiencies than vertical subsurface flow (VSSF) CW (Türker and Yaker 2017), being also the more traditional flow type (Xin and Huang 2017). In SSF CW, both the selection of the supporting media and of vegetation play key roles in controlling boron removal efficiency (Türker et al. 2016a, 2017). As expected, organic based media have been shown to be the most effective media for boron removal in CW in several studies (Türker et al. 2016a), reaching high boron removal efficiencies (91%, Türker et al. 2017). Therefore, agricultural waste materials such as rice husk are promising media to remove boron in CW. Although rice husk was used as the main media in CW aiming to remove organic pollutants and nitrogen (Tee et al. 2012), to the best of our knowledge it has not been tested for boron removal (or any other metal or metalloid). This study will contribute to fill this gap. Plants can also affect the boron removal efficiency in CW. It was recently reported that a CW planted with Typha latifolia presented a removal efficiency almost twice as much as that of an unplanted system (Türker et al. 2016a). Moreover, Türker et al. (2013) found that the main mechanism of boron removal in a polycultured CW was its accumulation in plants. These authors and others (e.g. Lizama Allende et al. 2014) reported that boron is translocated from roots to the above-ground tissues. As such, harvesting may be a good alternative to remove boron. It must be noted that the amount of boron that can be taken up by plants, and therefore harvested, will depend on the plant species (Türker et al. 2013). Moreover, tolerance and boron uptake differ not only between plant species (e.g. Xin and Huang, 2017), but also between ecotypes and cultivars within the same species. For example, Stiles et al. (2011) found that the US ecotype of Puccinellia distans was substantially less tolerant than the Turkish ecotype. On the other hand, Nable (1998) studied boron tolerance and accumulation in barley and wheat cultivars observing that they present a large range of resistance to boron toxicity. Therefore, choosing not only the adequate species but also their ecotype is crucial to the success of the treatment. Wetland plants such as Typha angustifolia have shown potential to accumulate boron in CW (e.g. Türker et al. 2016b). On the other hand, a boron-hyperaccumulator species, Puccinellia frigida, was recently identified growing in waters having extremely high boron concentrations (>400 mg/L) in Northern Chile (Rámila et al. 2015). This species also accumulates boron in its shoots over a wide range of medium concentrations (Rámila et al. 2016a). Therefore, both species have potential to be used to phytoextract boron in CW. This study explored a new inexpensive alternative to remove boron from wastewater. As such, the objective of this study was to evaluate the boron removal capacity of rice husk as main supporting media in a bench-scale HSSF CW system planted with T. angustifolia and P. frigida. In addition, to observe potential short-term effects of the presence of plants on the removal of boron, control cells were included. To simulate more realistic conditions, synthetic wastewater containing high concentrations of boron and sulfate was used. It should be noted that the focus of this study was to evaluate the effectiveness of rice husk as main media in a CW system for the removal of boron, and thus it does not aim to elucidate the processes involved or the effect of the plant species selection on the long-term performance. Synthetic wastewater was prepared using tap water (major ions concentrations: Mg2+ ~ 40 mg/L, Ca2+~ 125 mg/L, Cl-~ 200 mg/L, and SO42- ~ 290 mg/L). Boron was added as H3BO3 to a final concentration of ~23 mg/L, representative of boron-rich waters in Northern Chile. To simulate more realistic conditions, arsenic and metals also found in these waters, i.e. Al, Fe, and Pb (Dirección General de Aguas 2008), were added as arsenic acid; chloride and sulfate salts (As2O5 in H2O, FeCl3, Al2(SO4)3, PbSO4) to a final concentration of 0.1 mg/L, 5 mg/L, 5 mg/L, and 1.5 mg/L, respectively (complying the Chilean irrigation water guidelines). As a result, the synthetic wastewater had final sulfate and chloride concentrations of ~420 mg/L and ~290 mg/L, respectively. The wetland system consisted of nine acrylic cells (length: 60 cm, width: 20 cm, height: 20 cm) with two compartments of 5 cm length in the inflow and outflow sections, in order to facilitate distribution of water. Both sections were filled with gravel (10 to 20 mm diameter). The main section of the cells was filled with rice husk in 3 layers of 5 cm height and 1 kg weight each. This resulted in a rice husk porosity of 0.56. For the porosity determination, dry rice husk was weighed in a container. This container was subsequently filled with water and reweighed. The ratio between the volume of water and the total volume of the container corresponds to the rice husk porosity. The density of the rice husk in the container was the same used in the cells (260 g/L). Each cell had an outlet hose, which fixed the water level 2 cm below the media surface. To allow exposure to natural conditions (sunshine, wind) and avoid rainfall, the cells were located outdoors, under a clear roof (Santiago de Chile; semi-arid Mediterranean climate). Figure 1 presents pictures of the vegetated cells. Three cells were planted with Typha angustifolia, three with Pucinellia frigida and three remained as control cells (i.e. no vegetation was planted). T. angustifolia stems were obtained from the Aculeo lagoon, Paine, Metropolitan Region, Chile. P. frigida seeds, collected from a hydrothermal site in Northern Chile (17° 57´S; 69° 25´W, at 4150 masl), were germinated and grown according to Rámila et al. (2017). Around 10 months were given to P. frigida to grow from the seeds till they were planted in the cells. Plants were acclimated to wetland conditions for three weeks before the experiment started. During this period, control and vegetated cells were dosed continuously using tap water. Rice husk was obtained from a Chilean rice company and was directly used in the cells. Rice husk typically consists in 75% organic substances (cellulose, lignin, hemicelluloses), 15% minerals, and 10% water and microelements (Ye et al. 2010). A peristaltic pump was used to adjust the inflow rate by maintaining a constant water level in the inlet distributor. This distributor was connected to a 120 L tank, where the synthetic wastewater was stored. The theoretical retention time was set to five days, resulting in a surface loading rate of 15.5 mm/d and an average inflow rate of 1.16 mL/min. As such, water samples were taken every 5 days in the inlet tank and in the outflow from each cell. The system was continuously operated for five weeks during spring (Taverage: 13.5 °C, Tmax: 29 °C, Tmin: 2.7°C, RH: 68.9%). A longer experimental period was not possible, given the available resources and timeframe, which typically occurs in lab-scale CW experiments (Lizama Allende et al. 2014). Water losses due to evaporation/evapotranspiration were estimated by quantifying the difference in water volume entering and exiting each cell. This estimation was done in every sampling event, and the obtained data was used to theoretically correct the boron and sulfate concentration in the effluents, in addition to pH and total dissolved solids (TDS) (as reported by Zurita et al. (2012)). No distilled water was added to compensate water losses during the experiment (water lost by ET was not replenished). Boron concentration in water was analyzed using the azomethine-H method (Gupta and Stewart 1975). Sulfate concentration was determined using the SulfaVer 4 method 8051 (HACH commercial test). A HACH DR5000 spectrophotometer was used in both cases. The pH was measured with a Hanna HI2550 meter, and TDS with a Corning Check Mate 90 Conductivimeter, USA. At the end of the experiment, cells were dismantled and plants were harvested. T. angustifolia specimens were rinsed three times in deionized water and separated into shoots and roots. Tissues were dried at 60° C until constant weight, weighed (to determine the final dry biomass), ground, and sieved (≤ 0.5 mm). Boron extraction from tissues was done using a modified version of the high temperature oxidation: dry ashing method (Rámila et al. 2015). Samples were analyzed in duplicate and blanks were considered in every set of measurements. The translocation factor (TF) was calculated as the ratio of boron concentration in shoots to boron concentration in roots. To analyze the performance of the system, statistical analyses were performed using IBM® SPSS® Statistics 25 and a significance level of = 0.05. The Kolmogorov–Smirnov test was first performed in order to check data normality. To determine if the concentrations of the pollutants were different between the outflow and the inflow, one-way ANOVA test was used. When a significant difference attributed to the system was found (p<0.05), a multiple comparison post-hoc test was performed to elucidate differences between the cell types: Tukey’s test was applied when the assumption of homogeneity of variances was satisfied (as determined by Levene’s test), or Games–Howell’s test when this assumption was not satisfied. Kruskal-Wallis was used instead of one-way ANOVA when the assumption of normality was not achieved. Geochemical modeling was performed to evaluate if the abiotic precipitation of mineral phases could be involved in the removal of sulfate. The saturation indexes (SI) of minerals were calculated at 20 ºC, 25 ºC, and 30 ºC for each type of cell using the geochemical software PHREEQC. For these simulations, the pH was considered as 8.1 and the effect of water losses on the elements concentrations was considered. The calculated water losses were 39.4%, 37.5%, and 48.7 % for control cells and cells planted with P. frigida and T. angustifolia, respectively. Boron and sulfate concentrations were significantly lower in the outflow than in the inflow from all cells (p<0.001) (Table 1 and Table 2), indicating that CW removed both pollutants. Since the pollutants loading was different between cells, due to small differences between inflow rates, mass removal percentages were calculated as shown in Fig. 2. As it can be seen, boron and sulfate removal did not evidence trends over time, indicating that saturation/exhaustion of the medium was not achieved during the experiment. Data were corrected considering evapotranspiration and correspond to average values, numbers in brackets indicate minimum and maximum (three replicates multiplied by seven data sets). Boron mass removal was around 40% in all cells (Fig. 2). Despite being high, higher efficiencies have been reported in CW filled with other organic materials (e.g. 68% (Türker et al. 2016c) and 91% (Türker et al. 2017)). Also, higher boron removal efficiencies were obtained by Man et al. (2012) using rice husk in batch experiments. Several reasons could explain these differences, such as inflow pH, which is a key parameter affecting boron adsorption. Initial boron concentration, ionic strength, the presence of other anions, and hydraulic retention time could also be affecting boron removal (Türker et al. 2014). * Tests were not performed for pH, since no significant difference was detected between inflow and outflow. Boron removal was slightly higher in control cells than in vegetated ones (40.8±8.5% vs. 35.7±3.1% and 39.5±2.5% in cells planted with P. frigida and T. angustifolia, respectively; Fig. 2), although no significant differences were detected according to the Tukey post-hoc test (Table 2). Therefore, in contrast to what was observed by Türker et al. (2013) and Türker et al. (2016a), plants did not enhance boron removal. In the case of cells planted with P. frigida, this could be explained by the low vegetation cover achieved due to climatic conditions (probably high temperatures) that impede plants’ normal growth. In the case of T. angustifolia, as plants grew normally, achieving a higher vegetation cover, results indicate no clear evidence of a direct or indirect role of these plants under the conditions and the time period studied. Interestingly, high sulfate removal rates (> 40%) were observed in all cells, which is very promising because sulfate removal is a considerable task (Silva et al. 2012). Established methods for sulfate removal include the following: (i) biological treatment with sulfate-reducing bacteria; (ii) sorption technologies, including membrane and ion exchange, and (iii) chemical precipitation as gypsum, barium sulfate or ettringite (ibid). On average, sulfate removal reached 68±18% in control cells vs. 44±18% and 42±15% in cells planted with P. frigida and T. angustifolia, respectively. Fig. 2. Boron (a) and sulfate (b) mean removal percentage in terms of mass throughout the experiment. Error bars correspond to minimum and maximum values. The outflow of control cells presented significantly lower concentrations of sulfate than P. frigida and T. angustifolia cells (according to Games-Howell post-hoc test, Table 2). This was unexpected, since very limited sulfate sorption capability of rice husk was reported by Chockalingam and Subramanian (2006). Nevertheless, these authors also found that rice husk was an effective carbon source for sulfate reducing bacteria (SRB). This may be as well the case of this study. Removal of sulfate from circumneutral waters is typically associated with sulfate reduction processes mediated by SRB. In fact, this mechanism is thought to be the dominant pathway for sulfate removal in wetlands (Chen et al. 2016). The presence of both small black spots on the surface of the substrate and sulfidic acid smelling sediments in all cells strongly suggests the formation of sulfur minerals, which supports this hypothesis. The higher sulfate removal percentages observed in unplanted cells may be because oxygen transfer by plants roots affects SRB activity (Chen et al. 2016). Roots can generate oxygenated sediments, which limit the viability of SRB since these are generally obligate anaerobes. Thus, under aerobic conditions the precipitation processes associated with sulfate reduction may be less important. Nevertheless, it is not possible to rule out processes of metal sulfides precipitation and sulfate reduction in planted cells that could occur in anaerobic microenvironments or be catalyzed by oxygen tolerant SRB groups. Another possible process that could be involved in the removal of sulfate observed is abiotic precipitation. To investigate whether this could occur in the cells, the precipitation of mineral phases was simulated. According to the simulations, several Fe-, Al-, and Pb-bearing mineral phases were supersaturated at pH 8.1 (e.g. basaluminite, jarosite, among others; see Table A1), which suggests that abiotic precipitation could be one of the mechanisms of sulfate removal. It must be noted that no differences were observed in the precipitation potential of the above-mentioned phases between simulations considering different temperatures (20 °C, 25 °C and 30 °C; see Table A2 and Table A3). Sulfate phases have been observed previously in different sulfate-rich waters. For example, Karathanasis and Thompson (1995), reported that in interstitial solutions of a constructed acid mine drainage wetland (Fe=1,000 mg/L; pH=3) supersaturation of phases of jarosite, lepidocrocite, and goethite occurred throughout the wetland. This caused a marked reduction in Fe concentrations and a gradual decrease in pH and Al as the acid mine drainage flowed through the wetland. In addition, Gagliano et al. (2004) reported the transformation of schwertmannite into goethite in ochreous sediments profiles of a compost constructed mine drainage wetland; they found nodules of jarosite in deep zones (25 to 30 cm). By dissolution analysis in hydrochloric acid, they observed that jarosite contained mostly K (4.0 wt.%) with some Na (0.8 wt.%). These findings support the hypothesis that Na-jarosite and K-jarosite precipitation in the three types of cells (control, P. frigida, and T. angustifolia) may have impacted sulfate removal. Total dissolved solids significantly decreased in all cells (p<0.001), reflecting the removal of sulfate and boron (Table 1 and Table 2). However, no significant differences were detected between cell types (Table 2). The pH remained fairly constant, showing some variability in all cells without a clear difference between cell types, suggesting that the presence of vegetation had no effect on this parameter. In fact, no significant difference was detected between inflow and outflow values (Kruskall Wallis p=0.192), indicating that the system did not change pH. Both P. frigida and T. angustifolia specimens were able to survive in rice husk irrigated with synthetic water during the experimental period. To our knowledge, none of these species had been grown in rice husk before. It must be noted though that T. angustifolia grew normally, nevertheless, the P. frigida growth was restricted, probably due to climatic conditions. High boron concentrations were observed in shoots of both species (Table 3), despite the fact that boron is more available for uptake by plants at lower pH values (between 6.3 and 7.5; Türker et al. 2016a). Boron content in shoots of T. angustifolia was in the range of that reported by Türker et al. (2016b) (517 mg/kg for 27 to 39 mg B/L in the inflow). Translocation from roots to shoots in this species (Table 3) also agrees with what was reported by these authors. On the other hand, in shoots of P. frigida boron concentration was also in the range of what was reported for similar medium concentrations (450 mg/kg for 25 mg B/L in hydroponic culture (Rámila et al. 2016a)). 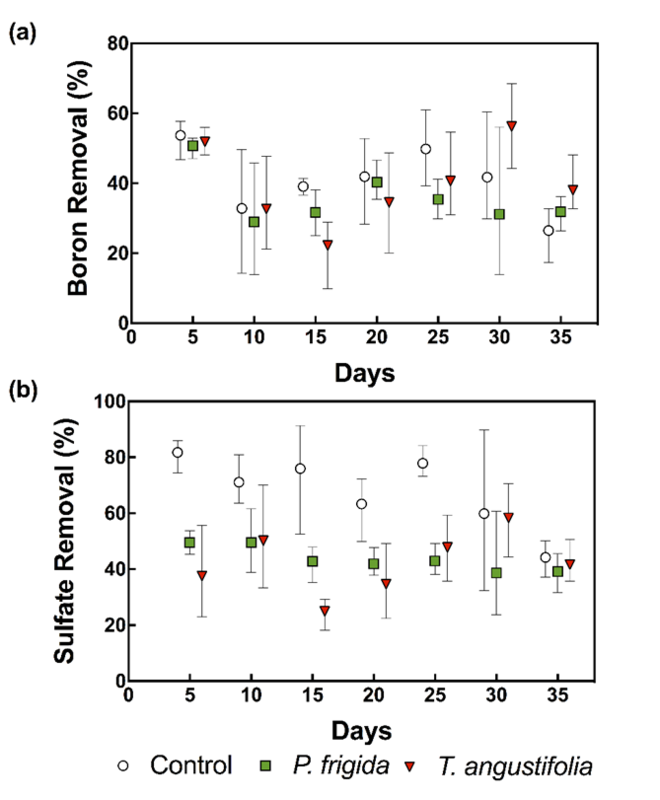 Despite the high boron accumulation observed in shoots of both species, plant uptake played a minor role in boron removal regardless of the wetland type (between 0.5 to 3.4% of the total boron mass removed in cells; Table 3). These results are in agreement with the non-significant differences detected between the boron concentrations in the outflow from planted and unplanted cells (Table 2). They also agree with other studies performed in CW with organic supporting media (e.g. Türker et al. 2016c, 2017), where plant uptake had only a minor contribution to the overall removal of boron, and the main sink of boron was the organic media. It must be considered that these results reflect only the short-term effect of plants under the conditions studied. 1 Boron retention is presented as a range. The upper limit was calculated by multiplying the total dry biomass by boron concentration in the corresponding tissue. The lower limit was calculated in the same way but background concentrations in plant tissues were previously subtracted (27 mg/kg and 64 mg/kg for T. angustifolia roots and shoots, respectively, and 74 mg/kg for P. frigida shoots). These values were used to calculate contribution ranges. * Data correspond to the average accumulation considering inlet and outlet tissues, except for P. frigida cell 2 (one specimen was digested). When comparing the two species, boron uptake by T. angustifolia contributed more to the overall removal than boron uptake by P. frigida, even though boron accumulation per unit of T. angustifolia dry shoot biomass was lower than that of P. frigida (Table 3). This is because T. angustifolia final biomass was higher than P. frigida biomass. In fact, P. frigida biomass obtained from cells 1 and 3 was not enough for the digestion procedure (< 200 mg). Future studies that include the quantification of boron retention in the substrate, a higher vegetation coverage, and a longer experimental period are required to gain further knowledge on the role of the substrate and vegetation in the performance of the studied system. This will allow to elucidate the main removal mechanisms and thus will help guide the design of CW for boron removal. Despite the above, this study provides valuable information to be considered when treating boron and sulfate rich waters since, to our knowledge, no studies have investigated the effect of competing anions in SSF CW aiming the removal of boron. To enhance boron removal, a natural treatment system having stages in series could be implemented, for example a vertical flow rice husk filter, followed by a hydroponic system with hyperaccumulators such as T. angustifolia or P. frigida. In this way, boron that was not retained in the first stage would be available for plant uptake in the second stage. To enhance sulfate removal, the second stage would not be required, and thus part of the first stage effluent could be either recirculated or directed to a second rice husk filter, with horizontal subsurface flow to favor anaerobic conditions and thus triggering biological sulfate reduction. Water losses were relatively high in all cells, especially those of T. angustifolia. On average, water losses were 39.4±7.8%, 37.5±5.9%, and 48.7±10.1% in control, P. frigida, and T. angustifolia cells, respectively. The similarity between water losses in control cells and P. frigida cells is probably due to their lower vegetation cover compared to that of T. angustifolia. High rates of water losses by evapotranspiration (ET) are common in CW (Beebe et al. 2014) and can hugely impact water treatment. In this study, although CW removed high percentages of boron in terms of mass, boron concentration in the outflow was even higher than that in the inflow in most of the measurements because of water losses and the consequent concentration of this element. Therefore, the mitigation of ET effects (e.g. coverage of wetland surface or using vertical wetlands) needs to be considered if this technology is to be used, especially in arid and semi-arid regions. Constructed wetlands microcosms with rice husk as main media can effectively remove boron (around 40%) and sulfate (up to 68%) from contaminated waters. No significant differences between boron concentrations in the outflow from vegetated and controls cells indicate that boron was mainly accumulated in the media rather than in plants. This was confirmed by the quantification of boron retention in the plants, which accounted for only the 0.5 to 3.4 % of B removed in the wetlands. Sulfate concentrations in the outflow from control cells were significantly lower than those in the outflow from vegetated cells, indicating that the presence of plants limited sulfate removal. Rice husk is an adequate substrate for T. angustifolia growth. We thank Paula San Miguel, Antonio San Miguel, the staff of the Department of Civil Engineering, especially Viviana Lorca, Manuel Cáceres and Jorge Castillo, for their support in the experiments. Dr. Gonzalo Pizarro is acknowledged for his help in seeds collection. Special acknowledgements to Gustavo Cobo from Carozzi for supplying the rice husk. Funding: This work was supported by the Department of Civil Engineering, the Concurso U-Inicia VID 2014, Universidad de Chile and by CONICYT FONDECYT initiation into research grant 11150401. Seeds collection campaign was funded by Proyecto CORFO 09CN14-5709. Dirección General de Aguas. (2008). “Evaluación preliminar de alternativas de mitigación de contaminantes en el río Lluta a partir de una caracterización de las fuentes de contaminación,” Ministerio de Obras Públicas & DICTUC S.A., Santiago, Chile. Gupta, S. K., and Stewart, J. W. B. (1975). “The extraction and determination of plant-available boron in soils,” Schweiz. Landwirtsch. Forsch. 14(2-3), 153-169. Maas, E. V. (1984). “Salt tolerance of plants,” in: The Handbook of Plant Science in Agriculture, B. R. Christie (ed. ), CRC Press, Boca Raton, Florida. 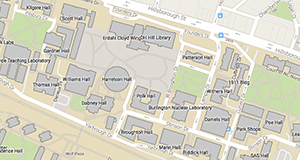 Man, H. C., Chin, W. H., Zadeh, M. R., and Yusof, M. R. M. (2012). “Adsorption potential of unmodified rice husk for boron removal,” BioResources 7(3), 3810-3822. Snoeyink, V. L., and Jenkins, D. (1980). Water Chemistry, John Wiley & Sons, New York. Article submitted: August 29, 2018; Peer review completed: October 20, 2018; Revised version received and accepted: November 9, 2018; Published: November 21, 2018.